FISH AS PETS is an aquarium and pond website specializing in News Articles and Commentary of Interest to the Aquarium Hobby. This web site was inspired and is sponsored by a long time friend of Aquarium/Pond Answers and our family of aquarium keeping websites to help inform those in the hobby as to news and misinformation sometimes disseminated. Most all articles have been by popular request! Includes articles submitted by members of Everything Aquatic too. Reviews of aquatic info for the healthy care of freshwater, saltwater, to pond fish and other aquaria. QUOTE: "Personally I believe part of the reason they went out of business was because of Mardel, who's products, in my experience, are more effective and a lot more well-known." This is patently incorrect, on both statements. First, while all reasons for business failure of this long time icon of professional aquarium keepers is not known, one of the reasons was the pressure from discounters such as Dr. Foster & Smith that has grown more with Amazon, Chewy, etc. The fact this person made this statement shows he likely was a victim of this too since Aquatronics had more than 10 times the products Mardel had, many covering problems no other aquarium medication company ever did or has since. Second, while I already partly answered the point as far as effectiveness goes, is also patently false, since Aquatronics was pharmaceutical grade, covered diseases Mardel did not and even when treating problems such as Columnaris, Maracyn Plus does not even come close to AAP/Aquatronics Spectrogram. Furan Two is by API which others corrected already, but what was not corrected is that it DOES NOT replace Spectrogram. What is also noteworthy is that Furan 2 is NOT pharmaceutical grade, while the nitrofurazone in AAP Professional Treatments "Spectrogram" is. It is a proven fact both scientifically and by 1000s of professional applications that for many diseases, most notably Columnaris, that Furan 2 by itself is not enough (nor is Kanamycin). 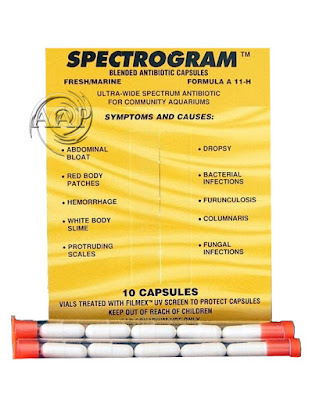 AAP (American Aquarium Products) has been able to bring back some of these "Aquatronics" products (now as AAP Professional Treatments", including Spectrogram via AAP's founder (Carl S) long time professional acquaintances in the industry going all the way back to "Archie's House of Pets" chain in the 1970s. He has ordered the products in bulk vials and used photocopied instructions to keep the price actually lower than using lessor effective products such as the before mentioned Kanaplex/Furan 2 combination! A few unique products brought back by AAP that have no other equals (including from Mardel, API or Seachem) include AAP Wound Control (a must have product to always have on hand), AAP Res-Q, and AAP Naladin (& soon Myacin). A few other AAP/Aquatronics products that while not as unique, are still the best at what they are meant for include Super Ich Plus, Greenex, Super Velvet Plus, & Sheildex. Need an aquarium water conditioner? See SeaChem; aquarium treatments. Tropical fish cold? Warm them with an Aquarium Heater or for Best in Aquarium Lighting Information. Comments are welcome, however the author’s busy schedules preclude the ability to have discussions or answers questions on subjects covered here at “Fish as Pets”, these are best taken to forums such as Everything Aquatic. Patented Lustar Hydro Sponge Aquarium Filters-Simply the BEST Sponge Filter available! Aquarium Lighting; The most current aquatic lighting information on the internet with research from all aspects of lighting, not just the aquarium industry.